Do you have a little baby at your home? May be your niece or nephew look that cute that you wish to see them in different baby costumes but there's no time for you to buy such dresses and then get such photos. 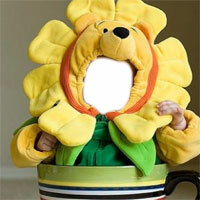 You can now do this through the Baby fun photo templates on this website and take a photo through your mobile or camera and upload the picture to the photo editor online on photomica.com. you can then adjust it easily by just dragging the face into the hole in the editor and save the image on the computer. These effects let your baby looks quite adorable and a cute baby.